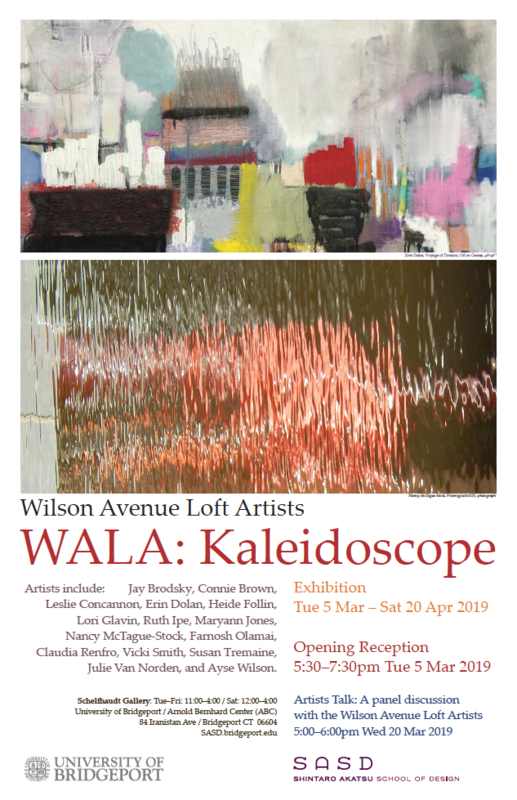 Tue 5 Mar – Sat 20 Apr 2019 — The Schelfhaudt Gallery at the University of Bridgeport is celebrating the Wilson Avenue Loft Artists (WALA) this spring with the show, “Kaleidoscope”. An opening extravaganza for the WALA artists will be held on Tuesday, March 5, 2019 and will be an evening for art lovers and the community. The public is warmly invited to Opening Night on March 5 from 5:30 p.m. – 7:30 p.m. Please come and bring friends and family. All are welcome! Complimentary refreshments will be served for your enjoyment. WALA Kaleidoscope will include works by 15 artists from the Wilson Avenue Loft. This exhibition will showcase a variety of art, exploring the use of color, composition, and texture. Jay Brodsky, Connie Brown, Leslie Concannon, Erin Dolan, Heide Follin, Lori Glavin, Ruth Ipe, Maryann Jones, Nancy McTague-Stock, Farnosh Olamai, Claudia Renfro, Vicki Smith, Susan Tremaine, Julie Van Norden, and Ayse Wilson. Gallery hours are Tuesday through Friday from 11 a.m. to 4 p.m. and Saturday from 12 p.m. to 4 p.m. If you are interested in visiting and cannot make our hours, please call 203-240-7333 to schedule an appointment. Arnold Bernhard Center (ABC) is the last building on the left side of University Avenue. Enter from THE BUILDING’S PARKING LOT ENTRANCE (East side). Gallery is down the hall to your left. 95 North to Exit 26 (Worden Avenue) Follow 95 service road to Iranistan Avenue,turn right onto Iranistan South past light to stop sign at Atlantic Avenue, left onto Atlantic Avenue (one block), right onto Rennell, right onto University, enter from THE BUILDING’S PARKING LOT ENTRANCE (East side). Gallery is down the hall to your left.